Kwanzaa is a weeklong celebration held in the United States and in other western nations celebrating with African communities. Every year Kwanzaa is celebrated from December 26 – January 1st honoring the African custom in African- American Community. People light a Kinara – which is a candle holder with seven candles and distribute gifts to each other. It was first celebrated in 1966-67 by its creator Maulana Karenga. Kwanzaa means “first Fruits”, Karenga said the word Kwanzaa is extracted from the Swahili phrase. Swahili is a Bantu language and the phrase he denoted is “matunda ya kwanza” which means “first fruits of the harvest". People celebrate Kwanzaa in their own way but they often include singing and dancing. Everyone gathers at one place and celebrate this day by telling stories, poetry, playing African drums, and having a large traditional meal. Given by its creator Maulana Karenga (generally called as Nguza Saba) Karenga mentioned that Nguza Saga or the seven principles of Kwanzaa are the best African practices and thoughts in continual give-and-take with the world. Umoja (Unity): To do your best for and to preserve unity in the family, community, nation, and race. Kujichagulia (Self-Determination): To describe and label ourselves, in addition, to producing and voice for ourselves. Ujima (Collective Work and Responsibility): To shape and preserve our community composed and craft our brothers' and sisters' difficulties problems our difficulties and to resolve them collectively. Ujamaa (Cooperative Economics): To maintain and construct our own businesses and to attain revenue from them together. Nia (Purpose): To make vocations collectively the constructing and rising of our community in order to reestablish traditional prominence. Kuumba (Creativity): Always do whatever you can, in order to make our tradition more gorgeous and valuable. Imani (Faith): To trust with all our hearts in our parents, our leaders, our teachers, our people, and the morality and triumph of our struggle. 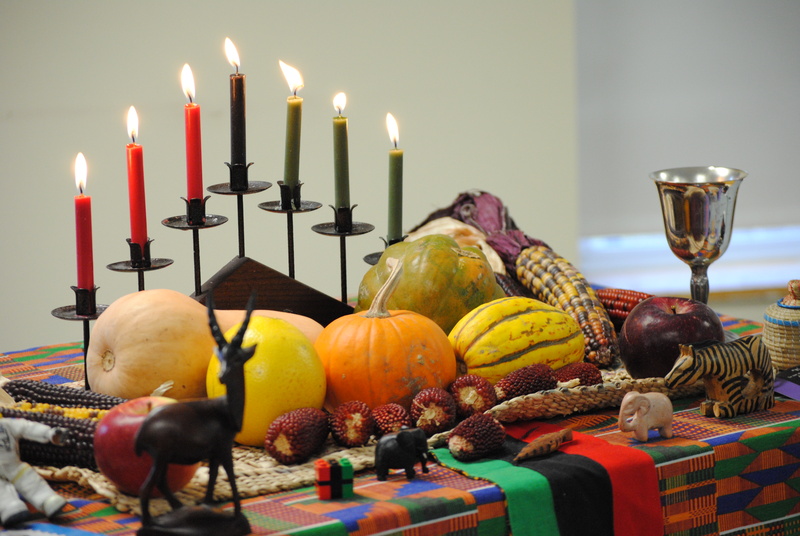 The symbols of Kwanzaa include mat (Mkeka), Mishumaa Saba (seven candles), a Kinara (candle holder), Muhindi (corn), mazao (crops), a Kikombe cha Umoja (unity cup) and giving shukrani (thanks) to African Ancestors, and Zawadi (gifts). Other symbols include black, red and green flags (bendera), books and other African artwork which resemble the African culture unity and reinforcement. 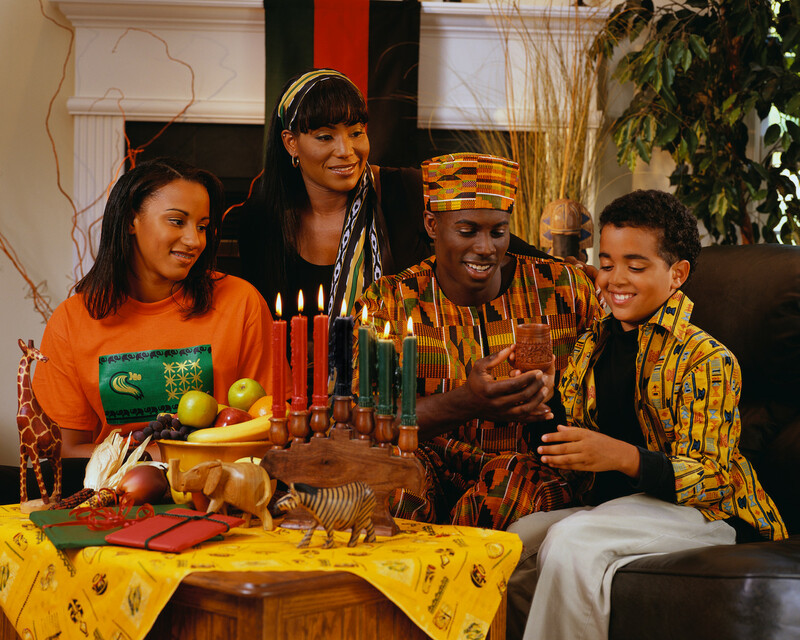 Families, who observe Kwanzaa wear African cloths (kente), decorate their houses with African artifacts and fresh fruits, which represent African tradition and culture. Parents make their children to participate in the celebration to honor their ancestors. The ceremony also includes music such as playing drums, performances by various artist, candle-lighting rituals, reading the African pledge and a feast (karamu). Cultural exhibitions held at the John F. Kennedy Center include the Spirit of Kwanzaa, interpretive dance, songs and poetry and African dance. According to the survey done by the National Retail foundation USA in 2004, it is found that 4.7 million people had planned to celebrate Kwanzaa. In a 2006 speech Maulana Karenga mentioned 28 million celebrate Kwanzaa. In 2009 the African-American cultural center had claimed 30 million people celebrated Kwanzaa. Celebration has also spread across Canada, where their black Canadian population started celebrating Kwanzaa. Similar celebration is also observed in Brazil.